We've found the UK's favourite picnic spots... we are truly spoilt for choice! We’re encouraging Brits up and down the nation to dust off their old blanket and get back to nature by dining alfresco this week! Of the four islands that make up Derwent Water, Saint Herbert’s is the largest covering between four and five acres. Named so after the saint who reportedly brought Christianity to the area in the 7th century, the island is still a destination for religious pilgrimages. JMW Turner firmly planted Crook O’Lune into history when he put brush to canvas with his landscape from 1821. The banks of the winding Lune river play host to a multitude of scenic spots for a picnic. Roseberry Topping is for the avid walkers who find solace in the great outdoors – this wonderous hill stands at staggering 1,049 feet making it the second highest hill on the North York Moors after ‘Urra Moor’. After reaching the summit complete your walk by walking through Newton Wood. Explore the abbey ruins which were inhabited in approximately 1130 and marvel at its medieval artefacts in the museum. The picturesque ruins can’t help but ignite your imagination and entourage you to explore. Grab a map from the visitor centre and walk in the footsteps of a monk. County Durham’s Gibside is an estate in the Derwent Valley and is run by the National Trust. The centrepiece is the neo-classical chapel, but the sprawling 600 acres are made up of all the different environments that make Gibside such a hotspot for wildlife spotting. This 14th century castle is one the best-preserved examples of medieval architecture this country has to offer. Highlights include the High Force Waterfall and the Woodland Play Area. 100 acres of winding paths, ancient woodland and natural pools, Ryton has all you need for a day out with the family. Find your own way and explore the rich natural habitats or take an audio guide to discover what makes this place so special. 10 miles west of Birmingham, Lickey Hills covers 524 acres of heathland, woodland and grasslands all making for varied habits for life to flourish. There is an adventure park for the kids, a sculpture walk and lots more to keep you busy all day. Sherwood Pines acts not just as a great natural area of beauty, but also a venue for outdoor events and is the largest public forest in the East Midlands with over 3,300 acres. Boasting a wide variety of events including Go Ape, Sherwood Pines never fails to excite. Not for faint hearted, this two-hour walk is more rewarding than challenging as it snakes through Padley Gorge, offering a plethora of scenic spots to stop for a bite to eat. Here you’ll be spoilt for choice with both The Walled Garden, and The Woodland Garden to explore. Colby Woodland Garden wins our vote for Wales’ number one picnicking area because of its natural playground for the kids. Littered with fallen trees, stepping stones and rope swings, you can guarantee the children will be entertained for hours. Huge grounds, a princess-like 19th century castle, and an abundance of different wildlife and horticulture: Penrhyn Castle is certainly a spectacular sight. In addition to all this there’s a dog walking trial, so that all the family can enjoy the adventure. We advise settling for your picnic in the Elysian Fields; where you can marvel at the magnificent coastal and mountain views. The Jurassic Coast is a hot spot for natural beauty, but the Dancing Ledge may just be the jewel in the crown. Just a few miles west of Swanage, Dancing Ledge may require a bit of adventure to reach but when you get there you understand just why so many do. Expect scenic walks, one of a kind views and the historic Great Globe, superb geology. The gateway to the Jurassic Coast is truly a can’t miss location. When visiting Canterbury, there is plenty of history to take in, but one place you cannot afford to miss is Westgate Gardens. Boasting four equally special and relaxing areas, peaceful walks and woodland areas make the possibilities for picnics almost endless. Hampstead heath is a popular spot for Londoners to frequent all year especially in the summer months. Make your way up to Parliament hill view point for a breath-taking view of London’s skyline nestled between leafy green trees. If you fancy a more active day out The Men’s and Ladies’ Ponds are open all year round. Who would have thought the largest park in London has so many hidden treasures? Richmond Park has over 600 red and fallow deer that roam freely within much of the park. If you like skipping stones why not set up your picnic blanket and basket beside one of the 30 ponds on offer. 1000 acres, three species of deer and an abundance of wildlife make Sheringham Park an amazing place for a picnic in the sun. Watch the birds and the butterflies from the park’s towers and take in the views of the coast and steam train lines that still serve the local area. Holywells Park is one of our all-time favourites. Absolutely brimming with history, here you can enjoy a picnic on land that goes back as far as the Stone Age. With Bronze Age axes and Roman coins being excavated amongst the grounds, why not enjoy some food for thought along with your picnic? Found at the foot of the Black Cuillin mountains, The Fairy Pools require a healthy walk to reach but the pay-off is well worth it. A 40-minute walk from top to bottom, visitors can wonder at the crystal blue water of the river Brittle as they tuck into their well-deserved picnic. The perfect place for the ultimate serene picnic, here you can explore beautiful gardens that lead you to the 17th century thatched cottage which – as one of the oldest standing buildings in Northern Ireland – is steeped in history. And if all this isn’t enough for you, how about embarking on an adventure through the endless woodland? With beautiful rocky paths that line windswept grasslands, Carrick-a-Rede is our runner up for Northern Ireland. Surrounded by ancient caverns and crystal green water, the only way to get on the island is to cross a bridge that’s certainly not for the faint hearted. “We’ve had the hottest May on record so there’s already been more picnics so far this year than we normally have. With a hot summer predicted we’re expecting more picnic’s in 2018 than ever before. To make the most of your picnic this we’re encouraging the nation to have spontaneous picnics. It’s so quick to grab a blanket and a selection of foods and just enjoy eating outdoors. 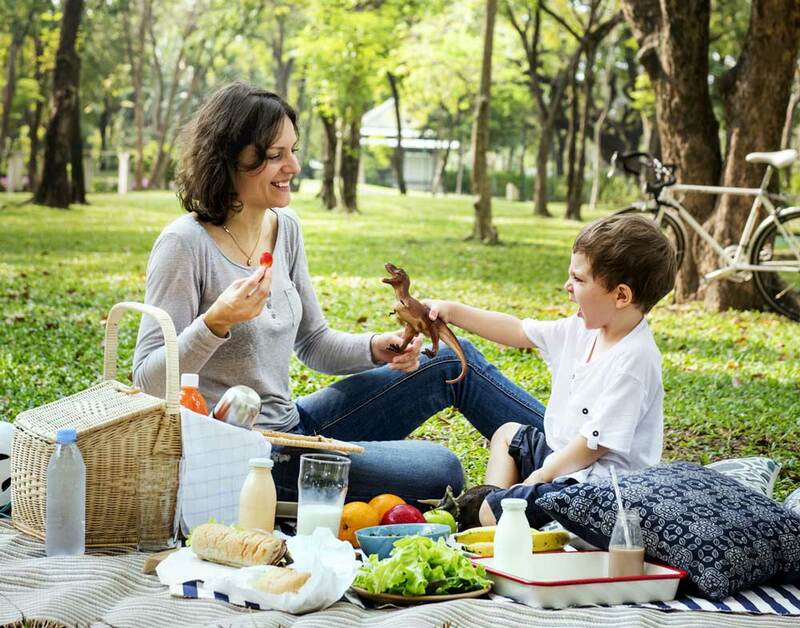 It doesn’t have to be a well-planned activity, you can even have a quick picnic in your lunchbreak”.